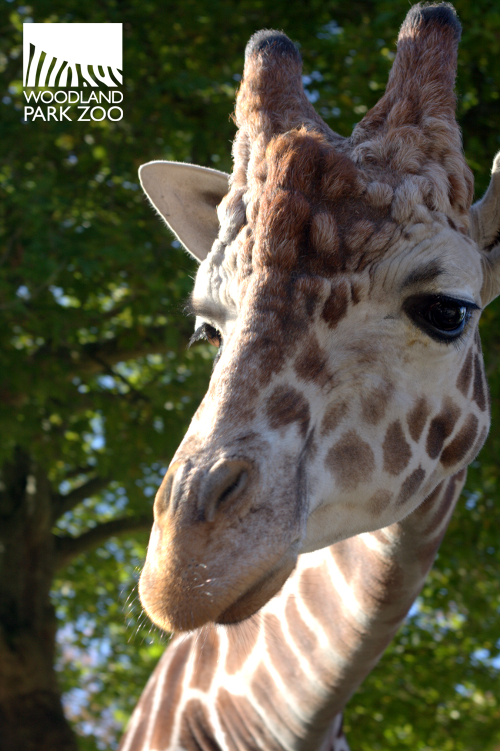 Chioke means “gift from above” and our big male giraffe was exactly that. He came to Woodland Park Zoo from Oakland Zoo in the spring of 2007, and right away you could tell he was a special guy. His full name is Chioke Biton Amani McKinley, though he had the nickname Toaster (as in the Brave Little Toaster) because he had health issues to overcome from when he was very young. Sadly, Chioke continued to have intermittent health concerns, and he passed away last month. It usually takes an animal a while to start to show trust in its keepers, but right from the get go Chioke, and his brother Kipande, showed great interest in what their keepers were up to, and that continued through his last days with us. 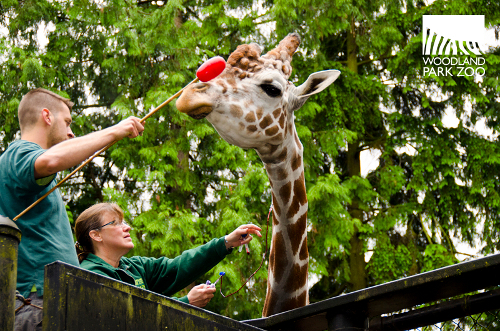 Chioke’s willingness to interact with both the keepers and the public is what made him a fixture of our giraffe experience every year. Chioke met and connected with literally thousands of people every summer. He always made a connection with the people near him, filling them with awe and amazement. They would often think "how can something this big be so gentle?" 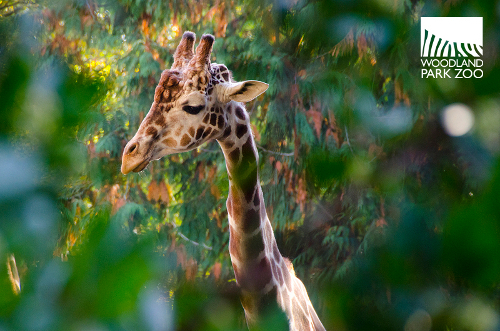 Photo by Matt Mills/Woodland Park Zoo. Every time one of his keepers opened the door to the barn, Chioke's ears would spring forward, his Eeyore-esque eyes would pop open, he'd turn his head away from his door (where he kept an eye on Olivia and Tufani, our two female giraffe) and within seconds he'd canter over to see what they were up to. He would usually stretch his head into the office space in hopes for a treat. Even if he had to work a little for it, Chioke was ever hopeful that keepers would have a slice of banana or a little bread to share with him. Photo by Katie Ahl/Woodland Park Zoo. Chioke's interest and trust in people and even greater interest in food is part of what made him such a unique animal to work with. Whether it was patiently holding his nose on a target while getting a blood draw, or calmly plucking browse out of the hands of children during summer break, Chioke was always calm and sweet. Photo by Amy Davis/Woodland Park Zoo. Chioke was an amazing animal spirit. 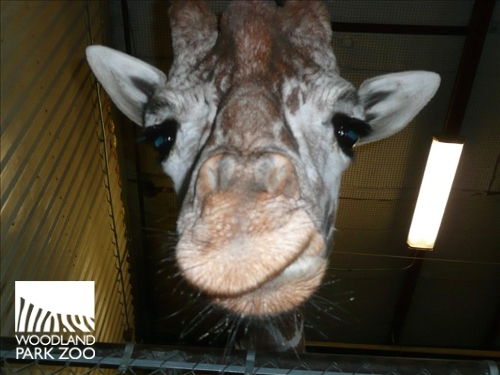 He is loved and deeply missed by his keepers, as well as volunteers, staff, and visitors here at Woodland Park Zoo. Keepers are keeping a special eye on Olivia who is assumed to be pregnant with Chioke’s calf. She is due this summer. We all hope this calf has a little of Chioke’s spirit and patience. Unlike the largely solitary snow leopard or jaguar, lions are the most social of the big cats, regularly living in groups known as prides. Lions live in matriarchal societies, where lionesses make up the majority of the pride and take on various group responsibilities. In most prides, lionesses live among their cubs, sisters and female cousins. A few males live within the group, though most are unrelated. Lionesses are slender, making them more agile and faster than the males, which is helpful since the females are the primary hunters within the pride. While females hunt, the males guard their territory and protect the cubs from larger predators. Once old enough, male offspring will be run out of the pride and forced to join a bachelor pride until they can dominate a pride of their own. 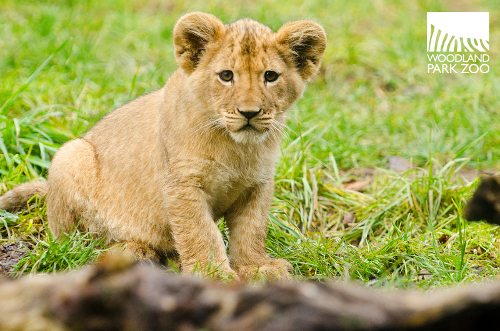 Have you visited the lion cubs yet? They are now on exhibit, weather dependent, from 11:00 a.m. to 2:00 p.m. daily in the lion viewing shelter in the award-winning African Savanna exhibit. Viewing hours may vary; check at the zoo entrance for updates upon your arrival. And don't forget--we're still looking for names for two of the cubs. Enter the naming contest by March 15! 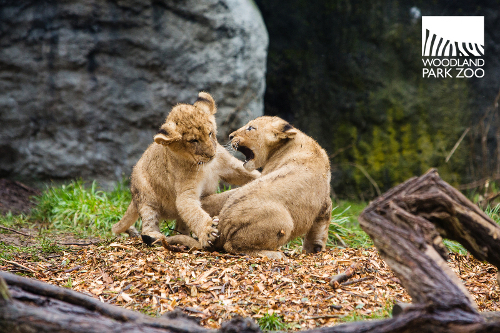 Two of Woodland Park Zoo’s quadruplet lion cubs need names, and we need your help! Enter the naming contest for a chance to win an amazing zoo prize pack, including a private viewing at the lion exhibit with a zookeeper! 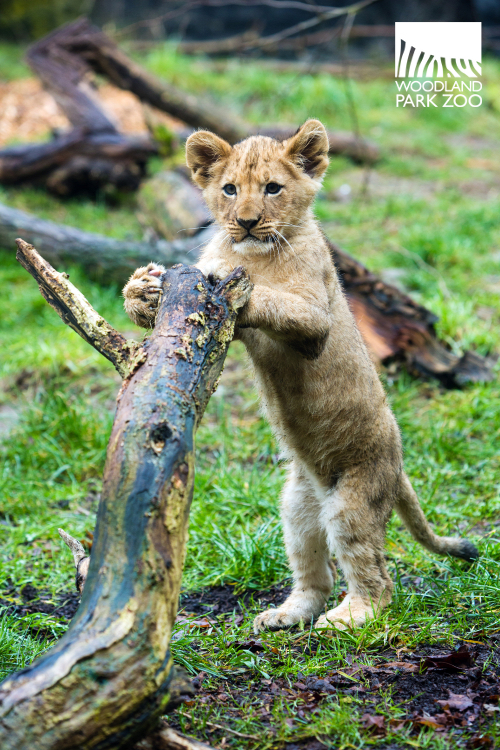 We’re in search of Zulu or Sotho names for one male cub and one female cub. The languages reflect a part of the range where South African lions live. A judging panel of zoo staff will select the cubs’ names from your submissions. 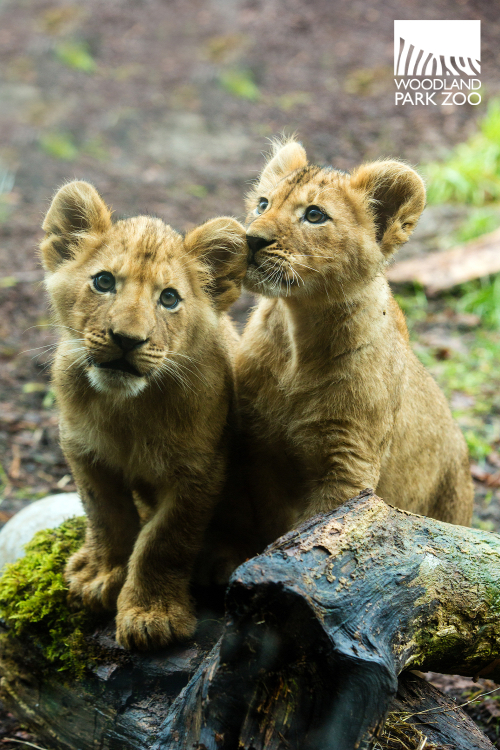 The other two cubs will also receive Zulu or Sotho names, this time chosen by zookeepers and long-time zoo donors who have helped bring big cats to Woodland Park Zoo. Need some inspiration? Here is a little bio on each of the two cubs to spark some ideas. Male cub. Photo by Ryan Hawk/Woodland Park Zoo. This male cub likes to rough around with his brother and often finds himself in mud. When not chasing his brother, sisters or mom, he can usually be spotted jumping on logs and wrestling sticks. He needs a name. What would you name him? Female cub. Photo by Ryan Hawk/Woodland Park Zoo. 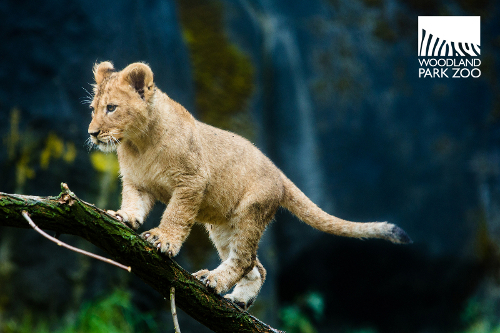 This female cub is playful and curious, and is usually among the first to investigate new experiences. She spends a lot of time with her mom and sister, when not being chased by her brothers. She needs a name. What would you name her? 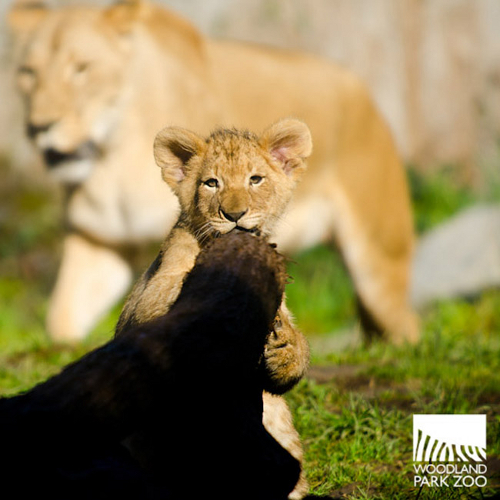 Now research Zulu or Sotho names that you think fit these cubs and send in your submission by March 15, 5:00 p.m. PST. Head to the contest page to submit your official entry. Will you help us spread the word? 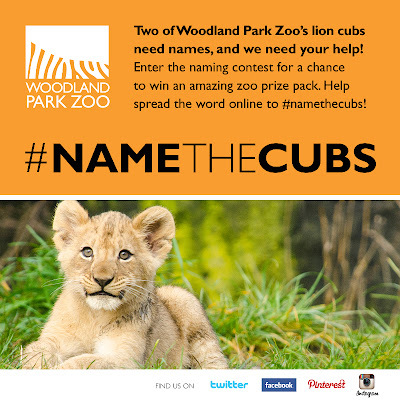 Use hashtag #namethecubs on Twitter and Instagram to tell your friends about the contest. Are you on Pinterest? Pin the image below to your Pinterest boards and direct your friends back to this blog post or to www.zoo.org/namethecubs. If you are on the search for Zulu or Sotho names, we recommend starting with an Internet search or talking to your local librarian for help. By choosing names from the Zulu or Sotho languages, we’re opening a dialogue with our visitors about the part of the world these South African lions are native to, which allows us to talk about what is happening with lions in the wild. The African lion is the only big cat not protected under the Endangered Species Act. As few as 32,000 African lions are estimated to remain in the wild and their future remains uncertain, particularly as the growth in human population continues to impact lion populations. 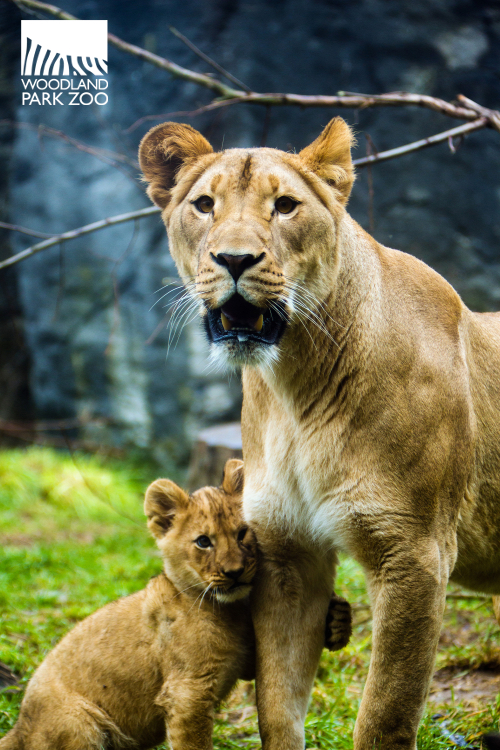 Through the zoo’s Wildlife Survival Fund, Woodland Park Zoo supports the Ruaha Carnivore Project through the Lion Species Survival Plan Conservation Campaign. The project works in Tanzania to mitigate human conflict with lions and other large carnivores that share the Ruaha landscape, while collecting baseline data on lion populations to help shape lion and large carnivore conservation. Learn more about the zoo’s collaboration with the Ruaha Carnivore Project, and remember that every visit to the zoo helps save wildlife by making this kind of conservation work possible. Thank you. Interested in pursuing your degree through the Advanced Inquiry Program? The application deadline is February 28! Woodland Park Zoo has teamed up with Project Dragonfly from Miami University in Oxford, Ohio to offer the Advanced Inquiry Program (AIP), an exciting Master’s program for a broad range of environmental and education professionals, including classroom teachers, zoo and aquarium professionals, and informal educators. The AIP offers a ground-breaking graduate degree focused on inquiry-driven learning as a powerful agent for social change, public engagement, and ecological stewardship. 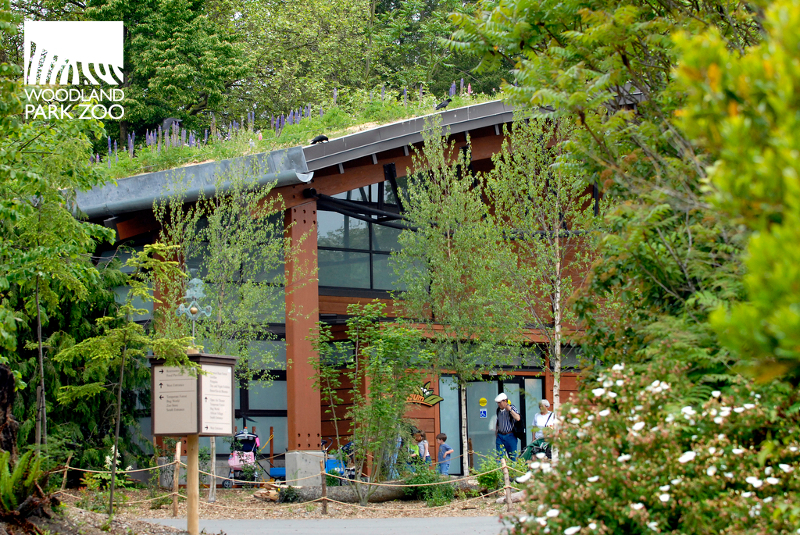 Woodland Park Zoo (WPZ) is one of seven institutions across the country that offers the AIP Master’s. The first AIP cohort at WPZ started in 2011 and students have already reported positive changes in their personal and professional lives. We asked Julia Ward, a Whittier Elementary fifth grade teacher and member of that cohort, to illustrate the impact that this program has had on her teaching, her students, and her life. 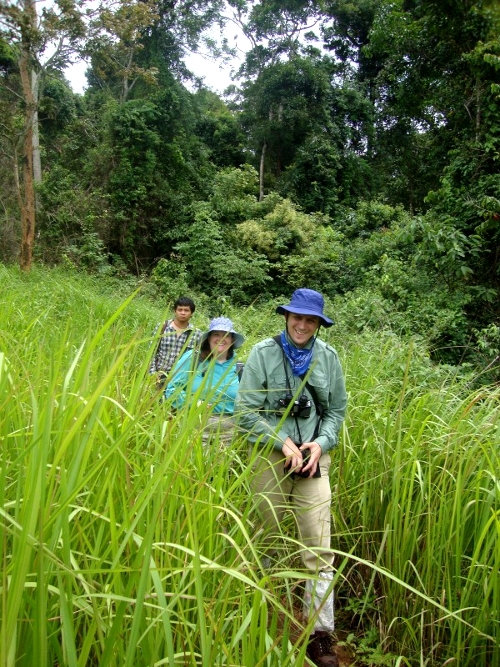 Advanced Inquiry Program graduate students Julia Ward and Mike Popelka in the field during their Earth Expedition to Thailand. Q: Why did you apply to the Advanced Inquiry Program? Julia: One of my co-workers forwarded an e-mail from the zoo and in that e-mail there was a tiny paragraph about the Advanced Inquiry Program. As I started doing a little research into the program I thought it was way too good to be true. I could get my Master of Arts in Teaching in the biological sciences, do the program while I was working, the price was unbelievably fantastic, and the icing on the cake was that my classes would be AT THE ZOO! I couldn't have imagined anything better. What is most surprising is that so far it has met all of my expectations and more. 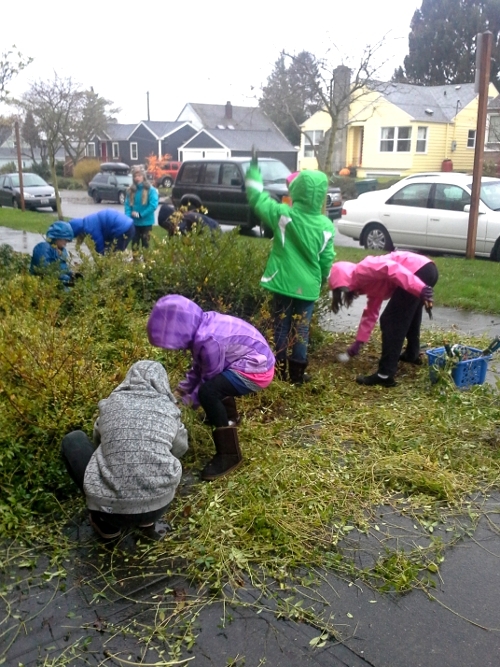 Julia Ward’s fifth grade students creating a schoolyard habitat at Whittier Elementary . Q: What impact has the program had on you personally and professionally? Julia: I have never personally done anything as academically challenging as this program has been. All of the assignments we are given and the articles we need to read have really pushed the limits of my understanding. At first, I was truly uncomfortable with the steep learning curve and high expectations. My trip to Thailand for my Earth Expeditions course took me further out of my comfort zone than I had ever been before. This kind of struggle, experiences, and academic growth has totally altered the way I think about myself now. I came into this program feeling like I was not really qualified because I was just a 5th grade teacher. I feel like an expert now. Student plant inventory of habitat garden. Q: What impact has this program had on your audience / students? Julia: This program has had a huge impact on my students. I was able to take all of my new learning and present it to my students as I went along. My students created multimedia projects for their website, participated in an environmental pen-pal project, mapped the local watershed, planned and conducted an evolution investigation, and they are currently working on a schoolyard habitat garden project. They also shared their research about the invasive species English Ivy, went on multiple environmental field trips, and even had environmental guest speakers. This program has pushed me to do things and create projects that I never would have thought to do on my own. My students have truly benefited. Kermit the Frog said it well: “It's not that easy being green.” Still, the actions we take every day impact the wildlife and habitats that surround us. As a society, how we deal with resource depletion, environmental pollution and climate change will decide the fate of the many animals and landscapes we love. 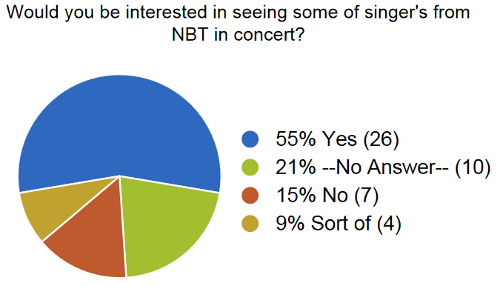 Northwesterners care deeply about this region’s natural heritage. As a conservation leader, so does Woodland Park Zoo. And so do our city’s leaders. Mayor Mike McGinn has asked the entire community to comment on a new Climate Action Plan for Seattle, which proposes ways our city can become carbon neutral by 2050. The ambitious plan follows the first period of agreements to reduce greenhouse gas emissions outlined in the global Kyoto Protocol, which concluded in 2012. I encourage you to explore the city’s plan and join the dialogue. Such a big goal requires building community support for climate action generation after generation. It takes all of us joining together in the effort, and Woodland Park Zoo’s broad reach to people of all ages will make a big difference. For decades, we’ve been coming up with ways to integrate conservation into zoo experiences, making it FUN for our one million annual guests to learn how to be green. 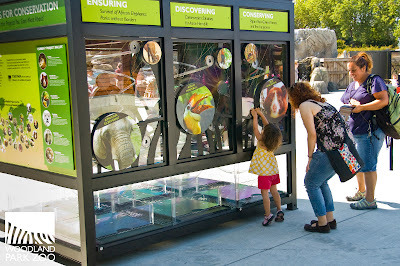 We do this by designing exhibits with nature as our inspiration, and we make every zoo visit a conservation action. Let me show you how. Piles of Zoo Doo compost being prepared at Woodland Park Zoo. Photo by Ryan Hawk/Woodland Park Zoo. One million guests a year and 1,000 animals produce a lot of waste, and we’ve become experts at recycling it into valuable resources. Our popular Zoo Doo compost program, nearly 30 years old and sold out every year, has kept millions of pounds of waste out of landfills. Our Sustainability Plan calls for us to reduce solid waste by 50 percent by 2020. With a grant from the U.S. Environmental Protection Agency, we conducted a comprehensive waste audit in 2011. We will accelerate our already high diversion rates with new purchasing practices, expand onsite recycling, and help even more guests and staff get in on the act. 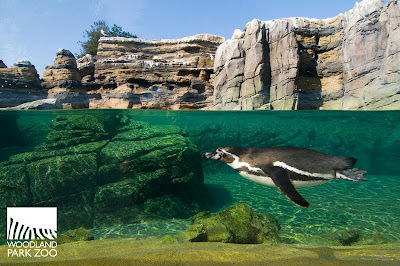 Water is filtered and recycled in the penguin exhibit, saving 3 million gallons of water a year. 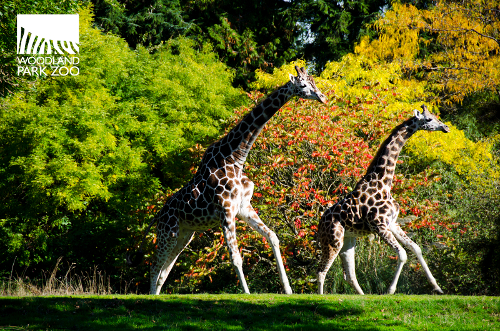 Image by Woodland Park Zoo. Water is a critical resource for every living thing. That’s why over the last 12 years we reduced our water consumption by 46 percent. Our plan calls for a further 30 percent reduction by 2020. The award-winning Humboldt penguin exhibit is a great example of how green exhibit design is replacing old, costly processes with naturally efficient ones – no more filling and dumping. A closed-loop, constructed wetland filtration system saves 3 million gallons of water a year, while geothermal energy heats and cools the endangered birds’ marine home. In May, guests will also marvel at the new Asian small-clawed otter exhibit’s pool, which incorporates a similar filtration design to help keep our cherished Puget Sound waterways clean. 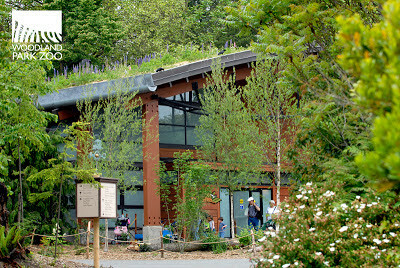 Zoomazium’s green roof is alive with vegetation. Photo by Ryan Hawk/Woodland Park Zoo. Because of our historic zoo’s older infrastructure, we have ambitious goals for heating and lighting our buildings in more ecofriendly ways. We aim to reduce our greenhouse gas emissions to 20% below 1990 levels by 2020. For years, LEED Gold-certified Zoomazium has been modeling green building for guests. Now, they can also enjoy rides under new solar panels on our Historic Carousel. In other off-exhibit areas, we are working to make climate control more efficient and better tailored to species’ specific needs. We recently removed the last four of the old underground oil storage tanks, are upgrading our boilers to high efficiency models, and plan further upgrades to the old feline house. 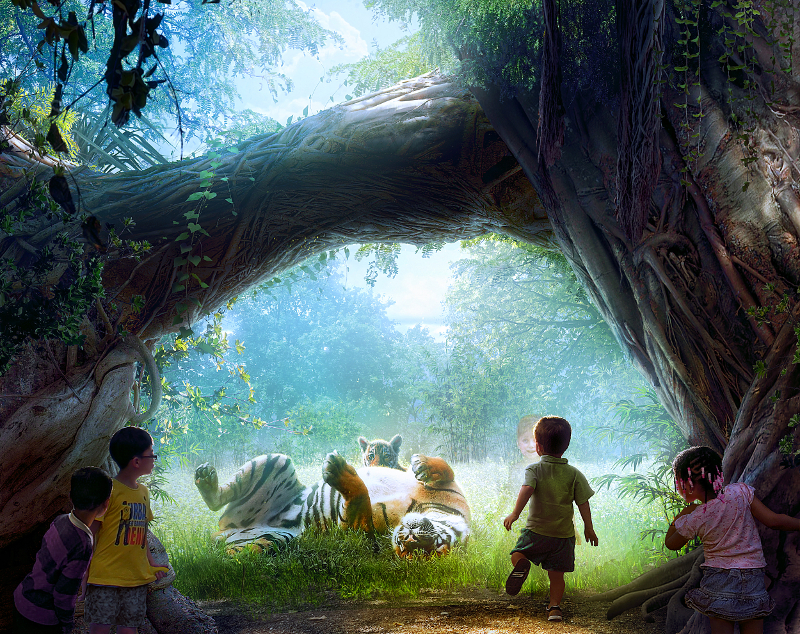 Artist rendering of new tiger exhibit complex. Rendering by Mir/Woodland Park Zoo. I’m excited to say that when phase two of the new, 2-acre Asian tropical forest exhibit complex opens (for Malayan tigers and sloth bears), which is slated for 2015, the entire complex should achieve carbon neutrality with an annual reduction of 92,000 pounds of carbon – equal to planting 11 acres of forest each year. While source reductions remain our first priority, we joined Forterra’s Carbon Capturing Partnership to offset emissions from other areas of the zoo. For example, last year we offset emissions from our Tropical Rain Forest exhibit and our new winter WildLights event. By walking the talk in our exhibit design and operations, we provide one million annual guests hundreds of genuine ways to learn how to help wildlife. Here’s what a just a few look like on any given day. A young visitor casts her vote at a Quarters for Conservation kiosk. Photo by Sarah Lovrien/Woodland Park Zoo. It starts with planning your zoo visit on our web site, where we encourage you to carpool, bus, ride or walk to the zoo – just like we do. Once here, we invite you to voice your choice through Quarters for Conservation, where you and other visitors “vote,” using tokens, to direct a percentage of your admission or membership fee to your favorite Partners for Wildlife projects. Since the program started in September 2011, thousands of these small but generous actions have added up to nearly $250,000 dollars annually to help save more animals in the wild. 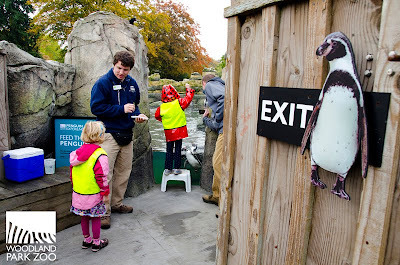 Young visitors line up to feed hungry Humboldt penguins. Photo by Ryan Hawk/Woodland Park Zoo. 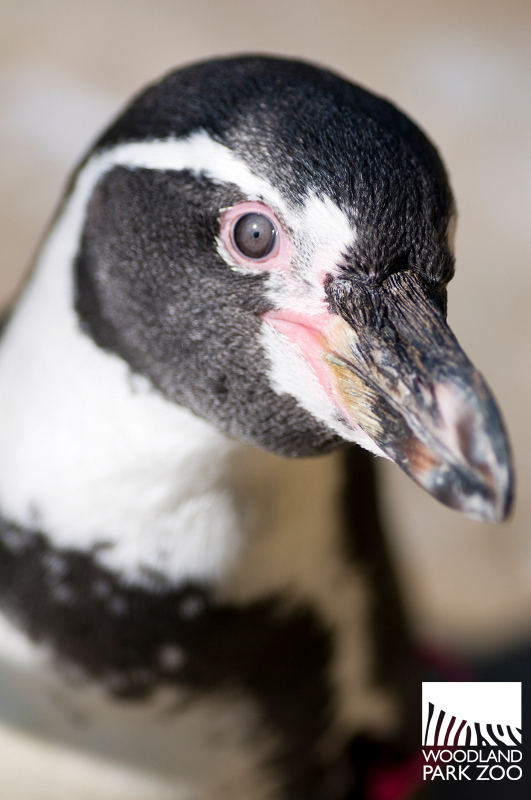 While feeding Humboldt penguins hand to beak, you learn from an expert zookeeper how you can grocery shop in ways that preserve the wild fish stocks this endangered species needs to survive. Ambling over to your next exhibit, your family gets engrossed in Tipping Point and On Thin Ice climate science activities, our newest visitor experiences. Where else is measuring your carbon footprint and learning how your actions affect climate such a blast? More than 50,000 people were reached in last year’s pilots. 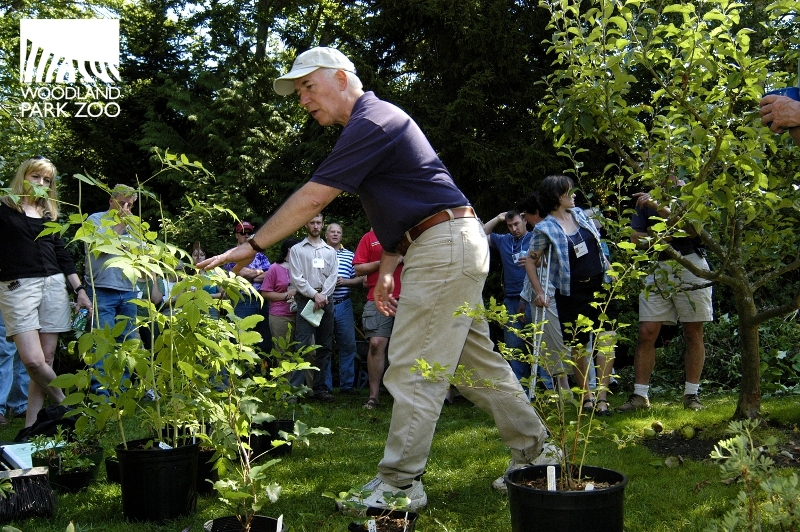 Fifty percent of participants reported learning something new about climate change. 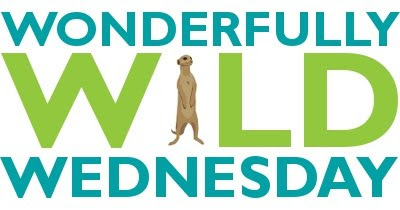 And, as a result of zoowide conservation messaging, 70 percent of visitors surveyed were able to identify at least one action they could take to help wildlife. What about you? A zoo horticulture expert demonstrates best practices for co-existing with wildlife to backyard habitat class participants. Photo by Ryan Hawk/Woodland Park Zoo. Hungry from all that green learning? You head to the Rain Forest Pavilion for a bite, where your food choices are sourced and served in wildlife friendly ways. Over lunch, your kids wonder how they can do more for wildlife at home and in your neighborhood. Before you know it, you’re signing up for our popular Backyard Habitat classes. You see, step by step Woodland Park Zoo’s 92-acre living classroom teaches everyone how to save the planet’s resources for generations to come. Building long-term capacity for climate action will take all of us joining together. A more sustainable future for wildlife and people is in our own hands. When you were 13, what did you want to be when you grew up? Did a career in science, technology, engineering or math (also known as STEM) appeal to you? How about a career that helped animals? With ZooCrew, we work with middle school students through after-school programs to introduce them to the varied STEM and conservation careers that are possible. They work with zoo advisors who represent different jobs across the zoo—from animal care to science writing—to get first-hand experience in how fun and rewarding these jobs can be. By working with professionals, our students can create meaningful, high-quality projects. 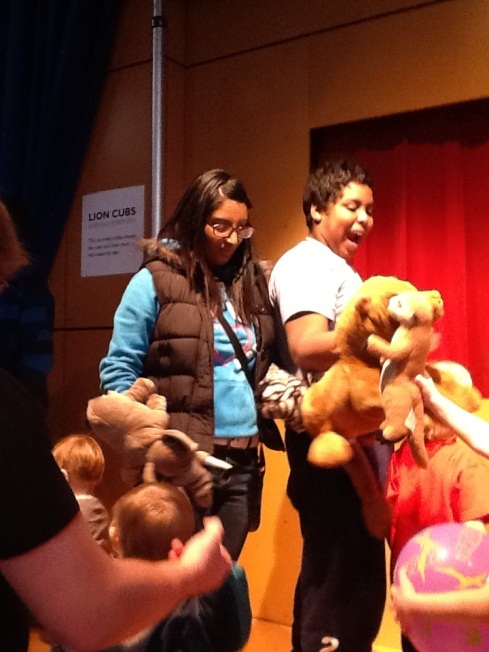 ZooCrew students learned that events are crucial in raising funds and awareness for our conservation mission. Those who chose this career had the option of working with zoo Events Manager Toni Radonich to generate ideas to expand WildLights, our brand new winter lights festival. (Drawings created using Doodle Buddy). One student even created a 51-page proposal replete with drawings, ideas, and animal facts. Another career that ZooCrew students could explore was Digital Communications with Digital Communications Manager Rebecca Whitham. They learned that creating effective online messages can help spread awareness of conservation issues. 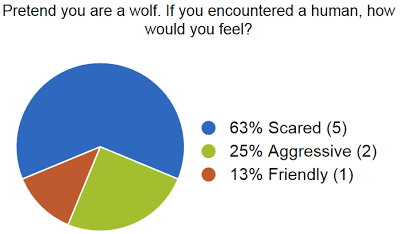 One team created a blog post (A day in the life of a wolf pup) while a second team created a short informational video (Wolves: Fact vs. Fiction) using iMovie. While ZooCrew students are the next generation of conservation and community leaders, some of them turned around and started raising the generation that will follow them. Working with Early Childhood Education Specialist Nemesia Herzstein and the Early Childhood team, they created an African Savanna-themed puppet show, starring lions, hippos, and a big-mouthed giraffe) and a Creature Feature that chronicled the story of a young wolf learning the qualities of leadership from a snake, bear and owl. After weeks of writing and re-writing, both teams got to perform for an enthusiastic group of toddlers and their parents in Zoomazium. Our final career option was Animal Management. Students worked with Collection Manager Deanna Ramirez to create enrichment items for the wolves or snow leopards. After the proposal, redesign, and construction, the teams watched as the animals enjoyed a stimulating challenge that they had created. 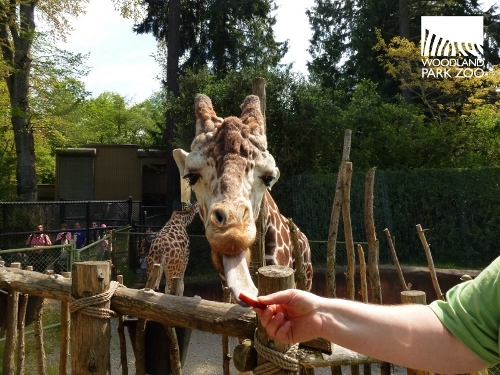 See recent blog posts 10 steps to an enriching summer and Tablets connecting youth to zoo professionals to learn more about ZooCrew’s projects and youth-adult partnerships. 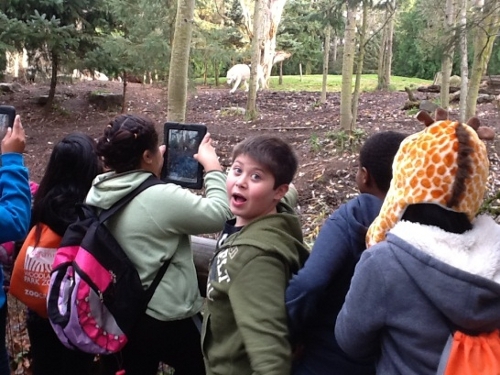 The students got to choose the conservation and career project that most interested them. If you were in ZooCrew, which would you have picked? 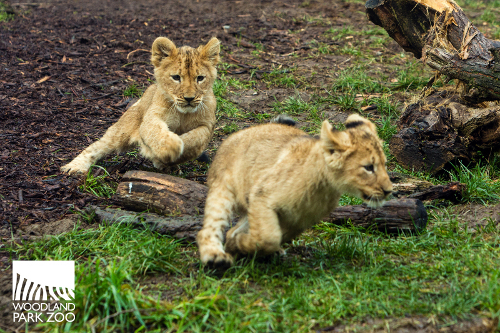 The quadruplet lion cubs are ready for the big time. The cubs officially debut on exhibit this Sat., Feb. 16! 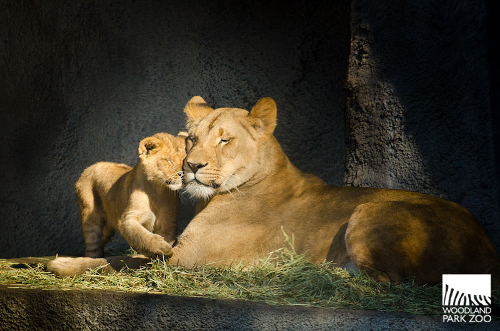 Starting Saturday, from 11:00 a.m. to 2:00 p.m. daily, the 3-month-old cubs and mom are scheduled to be on view in the lion shelter located in the award-winning African Savanna. Viewing hours may vary or may be canceled for the day due to weather and veterinary examinations, and will increase incrementally as the cubs continue growing. The cubs spent their first weeks in a behind-the-scenes maternity den with mom Adia, then took their first steps outdoors earlier this month. 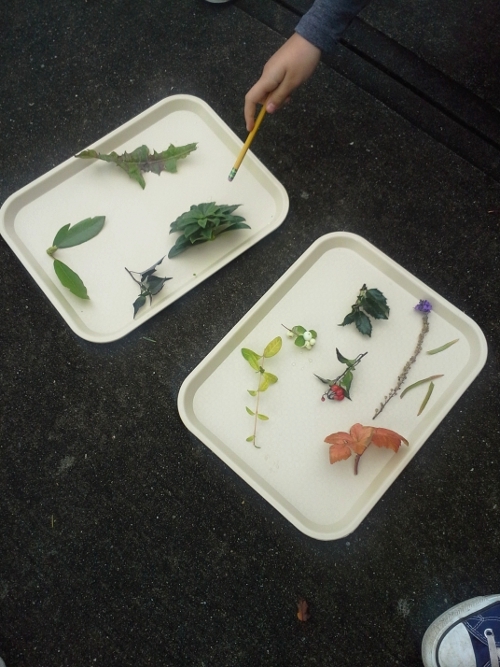 For the past two weeks the cubs have been exploring the outdoors through a series of introduction sessions. They adjusted to the outdoors right away, exploring all around, playing with sticks and trotting through mud. Their play is predator-like, loaded with mock stalking, pouncing, mouthing and biting. A temporary chain-link fence has been installed in the lion exhibit to provide a protective barrier between the cubs and the moat. The 13-foot-high fence also creates a small yard to help mom Adia keep track of her family in an outdoor setting. It’s a good learning experience for the first-time mom. The cubs continue to nurse and will do so until they are about 9 months old. They also are sampling solid foods such as ground turkey and beef. 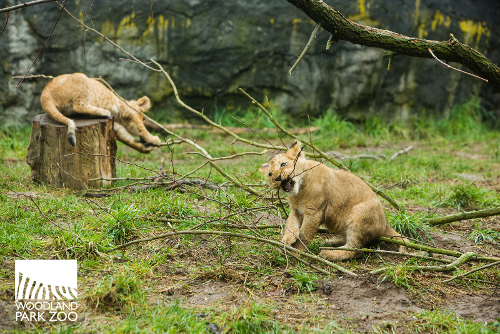 When the cubs are not on view, their father Hubert and another female lion, named Kalisa, may be in the outdoor exhibit. The cubs have not yet been named. We’ll invite you to name two of the cubs through a public contest coming up soon! More details on that to come. 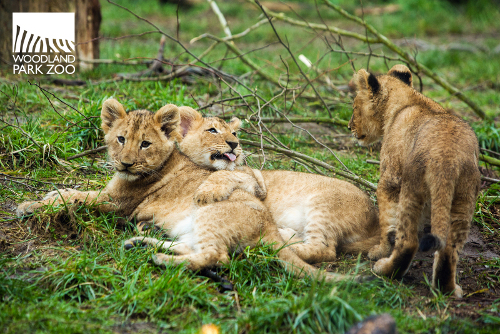 These cubs are irresistible and a great way to spark in visitors a love for and commitment to big cats in the wild. 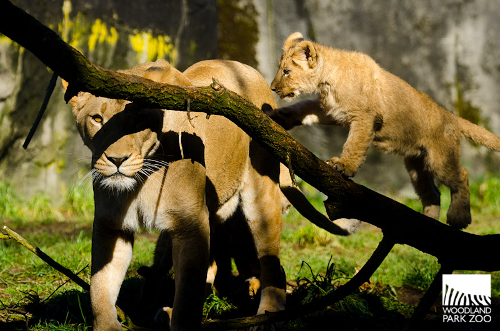 The lions at Woodland Park Zoo belong to the South African subspecies, Panthera leo krugeri. The African lion is the only big cat not protected under the Endangered Species Act. As few as 32,000 African lions are estimated to remain in the wild and their future remains uncertain, particularly as the growth in human population continues to impact lion populations. There is legal hunting of lions and retaliation killing because they pose a threat to humans and livestock. Sadly, lions are being increasingly killed in Africa to meet the demands of the illegal trade of wild animals and wild animal parts for the medicinal trade market in Asia. Many lions have died in the Serengeti due to canine distemper. Lastly, expanding agricultural and grazing regions have greatly reduced lion habitat, in turn increasing the risk of inbreeding and the loss of genetic viability. Ruaha lioness and cubs in Tanzania. Photo courtesy of Ruaha Carnivore Project. The U.S. 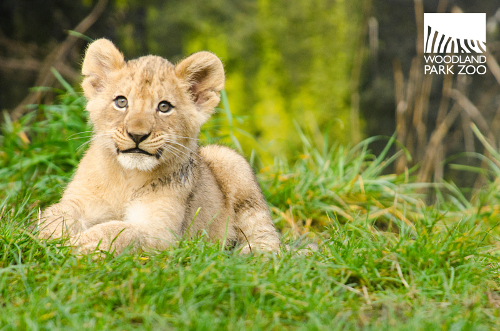 Fish and Wildlife Service has recently completed a public comment period, and is currently conducting a review of the African lion’s status in order to determine if the lion requires protection under the Endangered Species Act (ESA). The Service will review the best available scientific and commercial information from the public, range country governmental agencies, the scientific community, industry and other interested parties prior to issuing a proposal. 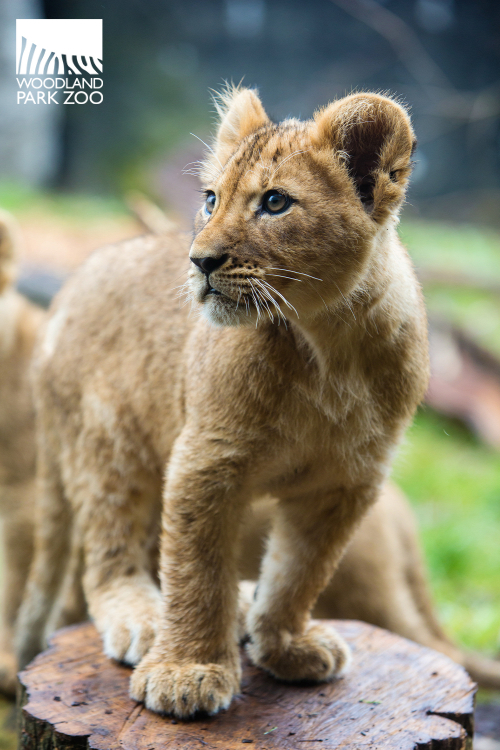 Through the zoo’s Wildlife Survival Fund, Woodland Park Zoo supports the Ruaha Carnivore Project through the Lion Species Survival Plan Conservation Campaign. 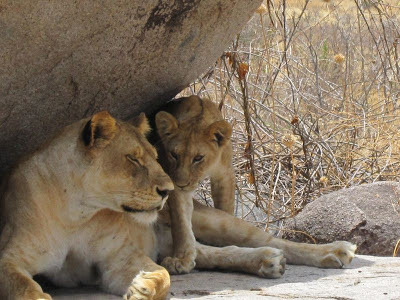 The project works in Tanzania to mitigate human conflict with lions and other large carnivores that share the Ruaha landscape, while collecting baseline data on lion populations to help shape lion and large carnivore conservation. We’re on the lookout for the wetlands version of a needle in a haystack: small beads, clumped together in tiny masses, hanging to the sides of sticks and logs, submerged under dark, muddy water. But the dozen wader-wearing volunteers in Carkeek Park on a Saturday morning are up for the task. A trained volunteer wades into the wetlands at Carkeek Park. Photo by Dennis Dow/Woodland Park Zoo. These are citizen scientists and they have studied and practiced for this—the search for amphibian egg masses in our own parks and backyards. Amphibians once occupied pristine wetlands across the Pacific Northwest. But now their marshy homes often flow into or crash up against urban and developing areas. Amphibians are closer than we often realize, and our actions impact them deeply. 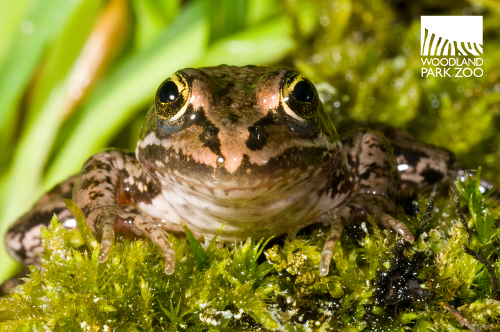 The endangered Oregon spotted frog is one of eight species the citizen scientists are monitoring. Photo by Ryan Hawk/Woodland Park Zoo. With their permeable skin, amphibians and their health are a direct reflection of the health of their habitat. Urban pollution and pesticide run-off contaminate amphibians and their wetland homes, while our ever-expanding communities shrink their habitat. 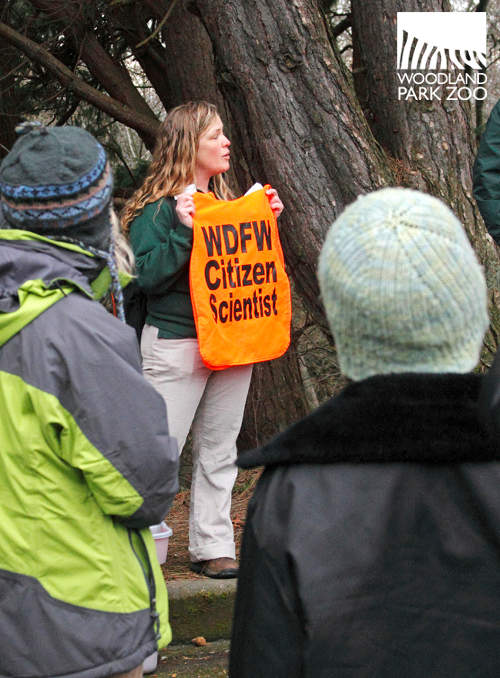 Citizen scientists working in local parks are easy to spot with these bright orange vests. Photo by Dennis Dow/Woodland Park Zoo. To protect amphibians—frogs, toads, salamanders, newts and caecilians—we need to understand better where their populations are and how they are doing. 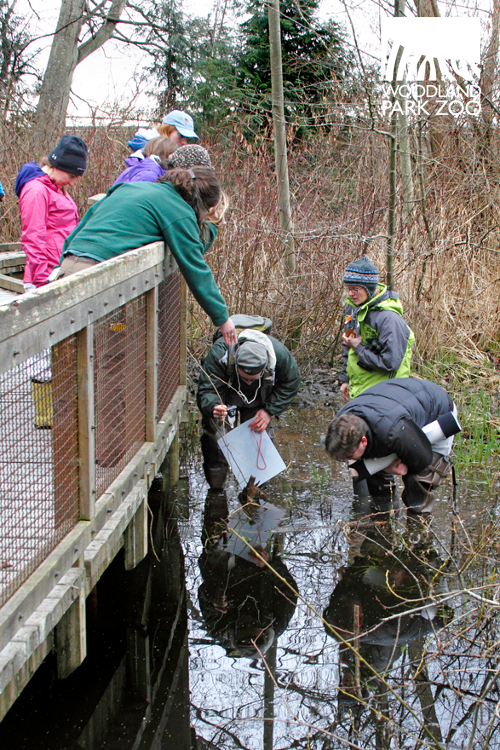 Woodland Park Zoo, Point Defiance Zoo & Aquarium, Northwest Trek and Washington Department of Fish and Wildlife are partnering together for the Amphibian Monitoring Program to gather that critical intel on amphibian populations in our urban and suburban landscapes. But we can’t do it alone. A group of volunteers have narrowed in on the location of possible egg masses. Photo by Dennis Dow/Woodland Park Zoo. When the zoo first opened the citizen science training class last year, it filled up so quickly that many of this year’s citizen scientists were actually from last year’s waitlist. This year’s crop of volunteers, including nearly 60 adults and 17 youth, have committed to no small task. 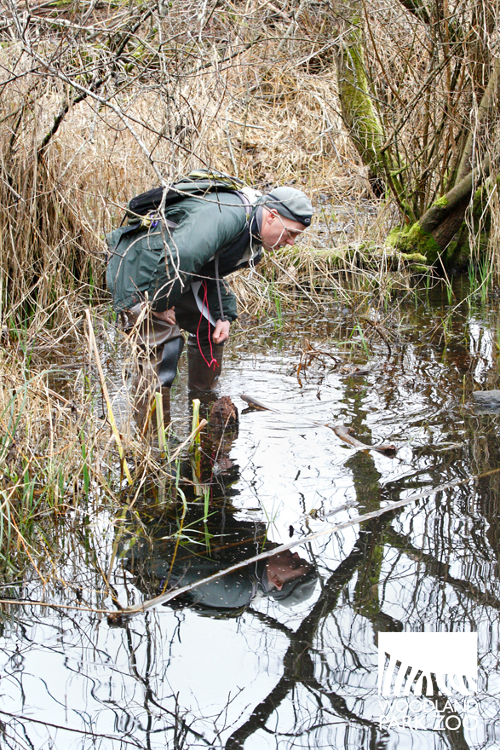 They train to identify amphibian egg masses and adults, then make an excursion once a month from February to August to survey a local pond or wetland for sightings. They must record and submit their findings to the Washington Department of Fish and Wildlife to be entered into the study’s data. The volunteer group surveys the site at Carkeek Park. Photo by Dennis Dow/Woodland Park Zoo. In Carkeek Park, this year’s training class is doing a field exercise—the final step before they are on their own for the season. 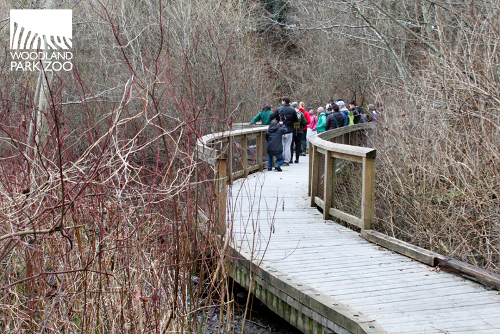 We’re walking along the boardwalks that overlook the wetlands in the park. The citizen scientists have come prepared. They sport waterproof scopes to help them look for the tiniest egg masses, GPS units to identify the exact location of their findings, digital cameras to make a visual record of their findings, and data sheets to record it all accurately at the moment of discovery. 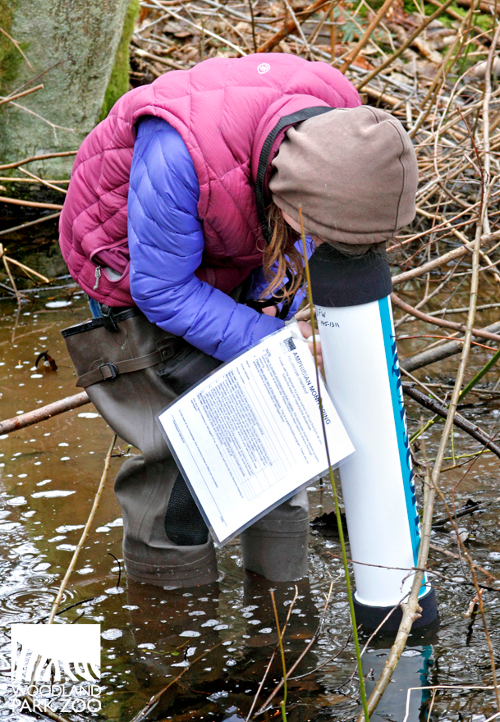 A young volunteer uses a waterproof scope to see through the water more clearly. Photo by Dennis Dow/Woodland Park Zoo. They carry field guides to help them tell apart the egg masses of eight species the study is particularly concerned with: western toad, Northwestern salamander, northern red-legged frog, Pacific tree frog, Oregon spotted frog, rough-skinned newt, long-toed salamander, and the American bullfrog (an invasive species). 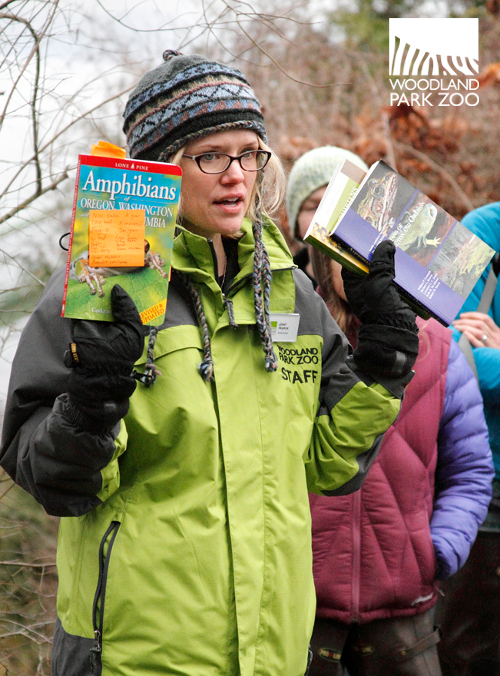 Dr. Jenny Pramuk, Woodland Park Zoo’s curator of reptiles, recommends amphibian field guides to the volunteers to help with identifying egg masses. Photo by Dennis Dow/Woodland Park Zoo. The volunteers wade into the water or tip themselves over the edge of the boardwalk to get a closer look. They carefully overturn some logs and sticks in the water, looking for evidence of egg masses or adult amphibians. But please, don’t try this at home. The volunteers receive an extensive lesson in bio-security protocols to ensure contaminants are not moved across sites and habitats are not disturbed irrevocably. Volunteers receive extensive bio-security protocol training to protect contaminants at one site from being traipsed into another. One key step? 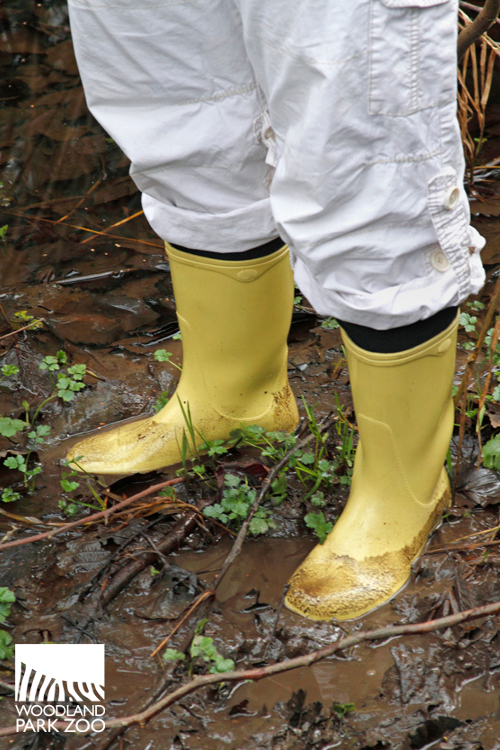 Decontaminate muddy boots after a monitoring session. Photo by Dennis Dow/Woodland Park Zoo. 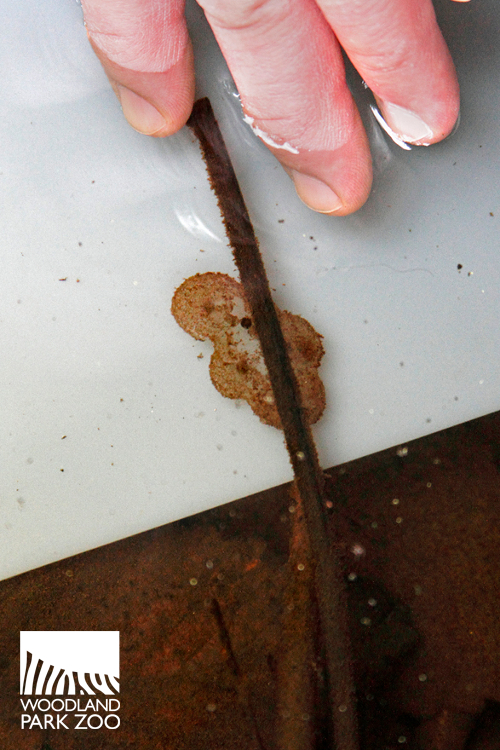 Soon they spot bead-like clumps—long-toed salamander eggs. No adults were seen, but the eggs give us the evidence we need that these salamanders are calling Carkeek Park home. The volunteers note their findings, and the season is off to a promising start. Long-toed salamander eggs clumped along a stick. Photo by Dennis Dow/Woodland Park Zoo. The training is a success—not just because we spot some masses to enter into the study’s data, but because the citizen scientists are feeling confident that they can do this on their own next time. Each volunteer has committed to a season of monitoring. We don’t know what they’ll find, but we know whatever they learn, it’ll be the key to making informed decisions about habitat protection, the key to giving amphibians a better chance in the Northwest. 1. Reduce pollutants to native amphibian habitat by eliminating chemical pesticides from your gardening practices. Pesticides get into water, which runs away from your garden and flows into surrounding water systems, bringing contaminants into wildlife habitat. 2. Improve the quality of wildlife habitat necessary for native wildlife survival by joining a habitat restoration program in your community. Looking for a program? Try our Backyard Habitat classes or read our Education department’s Backyard Habitat blog which posts upcoming opportunities around the region. 3. Take care not to release unwanted pets or animals into wild habitat—invasive species can outcompete or prey on native amphibians, and introduced animals can spread diseases that are harmful to wildlife and people. Call your local animal shelter to find a new home for an unwanted pet. 4. Get tips on co-existing peacefully with frogs and other wildlife in your own backyard at the Washington Department of Fish and Wildlife’s helpful Living with Wildlife website. What will you do to help amphibians? 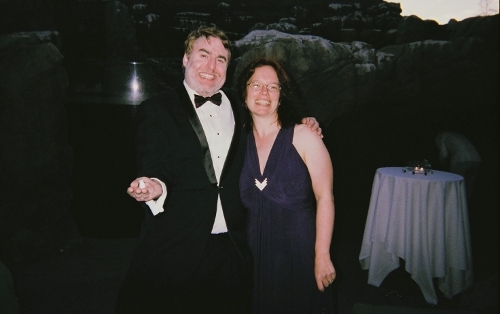 Editor’s note: Dave and Jacqui Kramer are Seattle writers who celebrated their 20th wedding anniversary with a vow renewal in front of some tuxedoed guests at Woodland Park Zoo —Humboldt penguins! In honor of Valentine’s Day, we’re sharing the love birds’ story, written in their own words. Twenty years ago, our wedding was a small affair conducted at the side of a small lake. We paid a little extra for the Justice of the Peace to come out of his office, where he joined a few of our friends, family members, and a pair of swans who appeared unprompted to attend our short ceremony. We were both underpaid, small-town newspaper reporters, so there was no reception and our honeymoon was one night away and then back to work on Monday. The happy couple on the night of their vow renewal at Woodland Park Zoo. Photo courtesy of Dave and Jacqui Kramer. For our 20th anniversary, Dave proposed renewing our vows and having a large reception for family and friends. 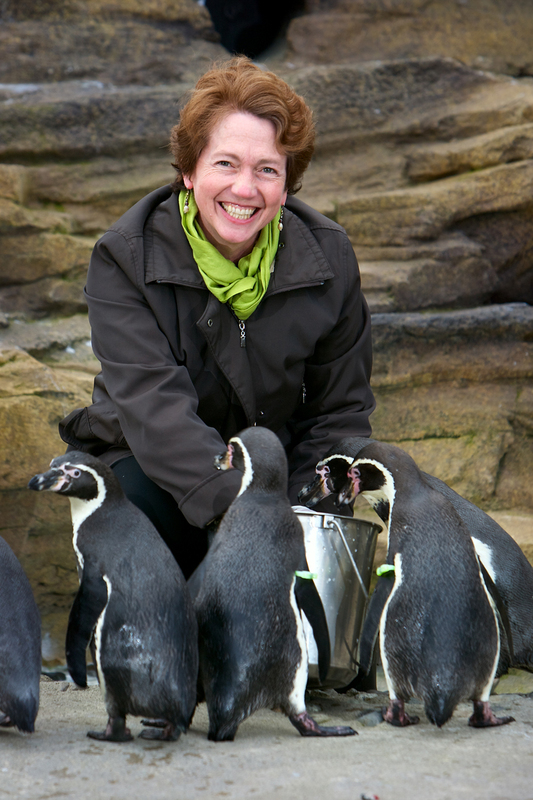 While exploring the vast array of unconventional party rentals options that reflected who we are as a couple, Jacqui found that not only does Woodland Park Zoo offer party spaces, but you can enjoy an evening with her power animal: penguins! Not to mention the zoo, a space in our community devoted to conservation, also symbolized our commitment to preserving endangered species—a cause that is very dear to our son. A penguin glides underwater at Woodland Park Zoo’s award-winning penguin exhibit. Photo by Ryan Hawk/Woodland Park Zoo. Penguins have always been special to us as a couple. You’ll find them all over our home—in stuffed animal form, that is. Jacqui collects them, and the pride of the collection is a giant body pillow-sized Emperor penguin. 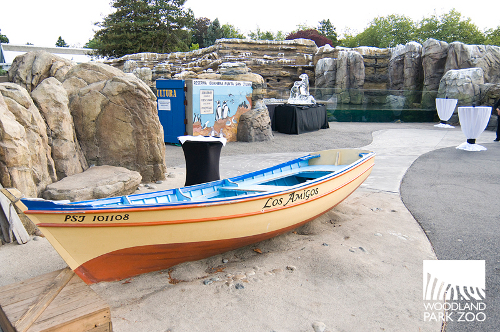 Guests encounter a scene out of Peru’s Punta San Juan coast when approaching the penguin exhibit. Photo by Ryan Hawk/Woodland Park Zoo. So, obviously, we were thrilled to host a party at the zoo’s award-winning Humboldt penguin exhibit! The penguin exhibit is a large, meandering space with plenty of nooks and crannies in which our guests could watch the penguins swim, dive and play. "We were all delighted to be out there with the penguins having a good old time!" said Jacqui's mom, one of the many out-of-town guests who flew in for the event. "Their choice of venue was emblematic of their shared creativity, playfulness and love of animals." We invited some of our son's friends, and they loved running around the large open space taking pictures with disposable cameras while the adults mingled, sipping wine and chatting before the short but sweet ceremony. 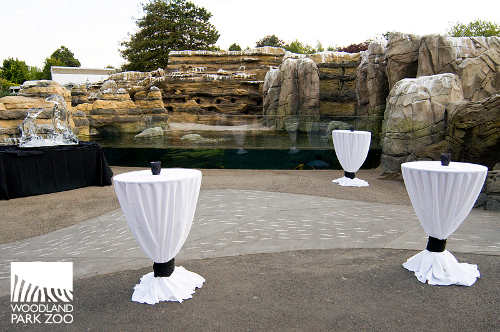 A casual cocktail event set-up at the zoo’s penguin exhibit. Photo by Ryan Hawk/Woodland Park Zoo. The friendly zoo staff helped us determine our layout and the best use of the space in which to entertain our guests. As a result, we were able to make the open aired venue feel intimate, romantic and comfortable at our late July reception. We made food and beverage arrangements with Lancer Catering, the zoo’s exclusive catering company, and smartly attended one of their free seasonal tasting events. This tempted us to add a few delicious items to our menu, notably cheesecake served in martini glasses with a wide selection of scrumptious toppings. These were a big hit! 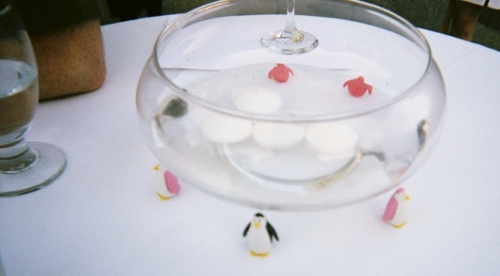 For venue décor, we tracked down colorful penguin erasers, and arrived early to place these around the floating candle arrangements on the elegant, white-clothed tables peppering the exhibit. A simple yet playful table arrangement at the Kramers’ vow renewal. Photo courtesy of Dave and Jacqui Kramer. Throughout the evening, we were serenaded by the distinctive honks of endangered Humboldt penguins. It was the perfect soundtrack to our perfect night. The penguins bring their own tuxedo to your special event. Photo by Ryan Hawk/Woodland Park Zoo. If you are looking for the perfect place to celebrate your one-of-a-kind love in a venue as unique as you are, Woodland Park Zoo offers indoor and outdoor spaces for daytime and evening rental. Explore the options at www.zoo.org/planyourevent. Then contact the zoo’s group sales team at groupsales@zoo.org or 206-548-2590 to start planning your event.